We all know fads come and go, (Vine, anyone?) but have you ever stopped to think about how much you truly rely on these platforms to host your content? Rule # 1, never put your audience in someone else’s hands. Avoid this social media faux pas at all costs! Are you working to grow or build an audience on social media? If so, I want to warn you about a very serious social media mistake that I see a lot of social media stars making. With recent news of Vine’s imminent death, it makes this post all the more crucial for ambitious social media brands and personalities. So if that’s you, pay attention–this is !important. How About a Few Stories? Before I jump into what the biggest social media mistake is and how to fix it, I want to share with you some real life stories that illustrate just how devastating this mistake can be. You’re smart, so you’ll probably figure out what this mistake is halfway through the first story–but read through anyways. There is a close friend of mine whom, for the purposes of this article, I’ll simply refer to as Bob. Bob was an early adopter of Blab. He began doing regular broadcasts on the platform, growing his audience and actually building a revenue stream from it. Bob is a smart businessman who had a solid revenue strategy for his live Blab broadcasts. He was making things happen in a very cool and unique way. But, in case you haven’t heard, Blab is dead. I have listed some of my thoughts about why Blab died, but regardless of why it happened, the fact of the matter is that it did. Without any warning and despite a level of perceived popularity that had people abandoning all other live streaming platforms. Well, unfortunately, as savvy as Bob was, he put all his eggs in Blab and didn’t have a backup. He believed that his success on Blab was all he needed and was completely unprepared for when it up and disappeared one day. Now Bob is left scrambling to salvage, in whatever way he can, the audience he took countless hours to build. Back in early 2014 Crystal Paine was building a thriving business thanks to massive amounts of traffic from her Facebook page. She had heard experts say that you should not rely so heavily on one social channel for your traffic but didn’t quite realize the gravity of that advice until disaster struck. Her Facebook audience was over 200k and growing by the thousands without spending a single dollar. One glorious day she had a post go viral, gaining more engagement than any other before. It was incredibly exciting for her and her business. Just five days later, her Facebook reach vanished. Her posts started reaching as little as only 1% of her audience and the traffic she was getting to her website was nearly gone. And it wasn’t a temporary bug. This is not where Crystal’s story ends. She learned a valuable lesson and recovered from it like a champion. But the hard lesson will always stay with her. Today we have a very real scenario where a large number of creators have made a name for themselves on Vine. They’ve amassed millions of followers and tens of millions of views. Some of these creators have even managed to carve out a significant living creating sponsored content on the platform. One such star that I am aware of was paid more than $15,000 for one 7-second clip. But now that Twitter has officially decided to shut down the app, many of these creators are scrambling to figure out what their next move is. They’ve realized that they never had control of their platform. 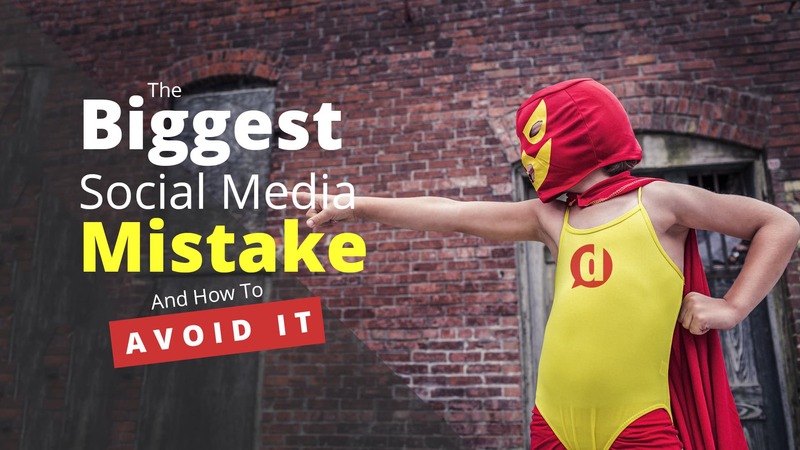 What’s the Biggest Social Media Mistake? As you’ve probably guessed, the biggest mistake you can make in social media is assuming that social media is all you need. No matter how great a social network is and no matter how popular you become, it can all disappear at any time. So the most important thing you can do, in growing your social media audience, is: invest in a personal website and grow your email list. His response nearly made me put my head through a wall. Let me make this very clear: anyone who tells you that you don’t need a website to develop a successful online presence is a short-sighted idiot. It’s either that they are a short-sighted idiot, or they haven’t been around for long (and they won’t be around for much longer either). His analogy of social media being “rented” property and your website being “owned” property is spot on. When you’re on someone else’s digital property, they make all the rules and call all the shots. They can giveth and they can taketh away. Facebook, in particular, has proven this time and time again by making unexpected algorithmic changes. And now we see it in the form of platforms just up and shutting down. The only way to ensure your online success does not disappear overnight is to 100% own and control your primary place of growth. You can call this a home base or a digital HQ if you like. What Does it Take to Have a Personal Website? There is literally no excuse these days for not having a website of your own. You can be up and running with a web property in less than 5 minutes if you needed to be. Gone are the days of having to know HTML and CSS because the technology for building a website has evolved dramatically over the last 10 years. But still, many people who have yet to create a website of their own have questions. I’m going to do my best to answer those questions for you and remove all the excuses for not sucking it up and getting yourself a website now. How much does it cost to have a website? This is the question that many people begin by asking. They tend to assume that the cost is greater than the reward. Some web hosts will even give you a free domain name with your hosting package. Let me tell you from experience, though, you never want to go with the cheapest solution. You really do get what you paid for. Let’s assume the average cost of a domain and moderately good shared hosting plan. The average yearly cost of owning a bare-bones website is about $130 per year. Anybody can do that. Especially if you expect to grow an audience and make a living online. It literally takes me 5 minutes to set up a new website. But that’s because I’ve built a lot of websites in the last 5 years. But you don’t need to have any experience in order to launch your first website in less than 20 minutes. All you need is a webhost that has 1-click WordPress installs. All webhosts worth your time have 1-click WordPress installs. Your hosting provider will likely have plenty of documentation or walkthroughs for you. They may even offer a service to set it all up for you. Then, boom! You have your own website that you own and nobody else can control. You can then use your social media profiles to send people to it. However, now you then need a way to capture their email address and keep in touch with them. When you send someone an email, 90% of intended recipients recieve it as opposed to the 2% or less reach that you typically get with Facebook. I could go on and on, but you can read more great stats from Campaign Monitor’s blog post on the subject. What Does it Take to Build an Email List? Having an email marketing strategy is not difficult. In fact, if you wanted, you could just read the book on it (it’s free)! I’m going to go over all three of those points in detail further into this post. Before I do, I’m going to answer the question most people will be asking when they hear they need to have an email list: What does it cost to have an email list? Well, to do email marketing right, you need to have the proper email marketing software to do all your heavy lifting (like managing subscribers/unsubscribers, sending in bulk, gathering analytics, etc.). The trouble is, the cost can vary greatly depending on which provider you go with and what size your email list is. 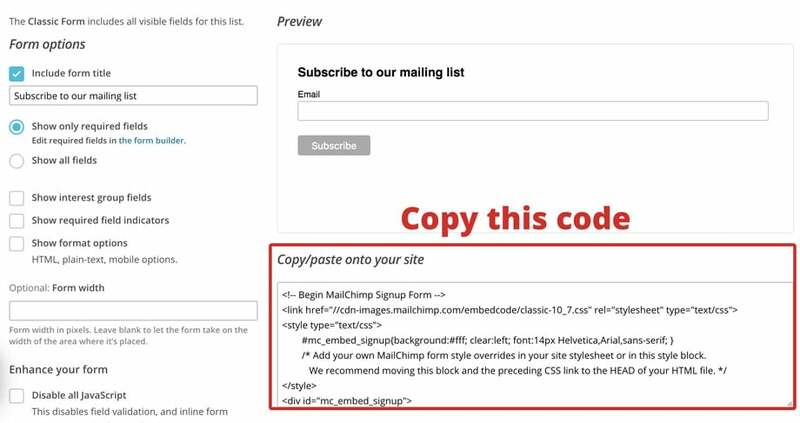 MailChimp: Free for up to 2,000 subscribers, plans start at $30/mo for up to 2,500 subscribers. ConvertKit: Starts at $29/mo for up to 1,000 subscribers. Aweber: Starts at $19/mo for up to 500 subscribers. Mad Mimi: Free for up to 100 subscribers, plans start at $10/mo for up to 500 subscribers. Constant Contact: Starts at $20/mo for up to 500 subscribers. Those are the best options for beginning your email marketing journey. If you’re looking for the simplest solution, my highest recommendation is ConvertKit. It’s not the cheapest, but it will give you the simplest tools and they have amazing resources for getting you started. If you’re looking for the cheapest solution, go with MailChimp. It served me well and they have a beautiful user interface that allows you to easily create, send, and track your email campaigns. And despite being the “cheap” solution for beginners, their software is second only to my top pick, ConvertKit. This can be as simple as a link to your sign-up page, a form in your blog sidebar or as sophisticated as a content upgrade or exit-intent pop-up. It’s just a matter of how much time, energy and know-how you have. You can start out simple by just using the copy/paste embed code they give you. If you’re on WordPress, this is as simple as placing a text widget into your sidebar and pasting the embed code into it. If you want to get a little more strategic with your email opt-in placements then you will need further tools to make your life simpler. As I said previously, OptinMonster is a great solution. With so many people asking to get into your inbox these days, you need to come up with a compelling reason for people give up their email address. You can’t expect to just throw a sign-up box in your sidebar with the words “Subscribe to my email list” and expect it to work. No, you need to come up with a compelling reason for people to trust that giving up their email address to you is worth it. What could I do that would make their life easier? If you can answer any/all of those questions, you can come up with a compelling reason for them to give you their email address. Create something that answers their question and offer it for free in exchange for subscribing to your email list. This is also known as a Lead Magnet. Now, don’t let creating these delay you from taking action. The most important thing is that you get started collecting emails right away. Every successful digital entrepreneur will tell you that their biggest regret is that they didn’t start building an email list sooner. Don’t make that same mistake! Get started now! The only way to ensure that your social media success is protected from unforeseen changes, shutdowns or anything else is to have full control over it. The best way to do that is by owning your own website and email list. You can then utilize your social media platforms to drive people to your website where you control the environment and can capture their email addresses. Doing this will save you from ever having to worry about or experience that fateful mistake of taking a social platform for granted and having it swept out from beneath your feet. What question is keeping you from launching a personal website right now? Let me know in the comments below.